A rendering of a proposed professional soccer stadium in Hartford, located where Dillon Stadium is now. 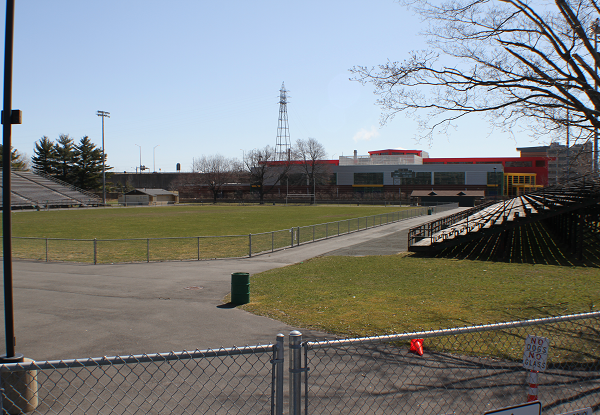 This is the second of two major stadium projects being pursued in the city. “I don’t think, in its current form, it will happen before this council, unless some things change,” said Hartford Councilman Ken Kennedy, who was one of the project’s biggest supporters until this week. Kennedy was hoping to approve the project before the end of his current term, but that now seems unlikely -- and the support that he would need to pass the project on the city council appears to have disappeared. Those concerns are the result of reporting in The Hartford Courant that highlighted past legal and financial troubles of James Duckett -- the man who on the one hand said he had $440 million in the bank for development deals like this, but who on the other couldn’t pay his rent. Dillon Stadium in Hartford, CT.
Last week, Duckett told the Hartford City Council that he would build a 15,000 seat soccer stadium with 25 executive suites at the site of the current Dillon Stadium -- just off I-91 near the historic Coltsville section. Dillon has been the home for high school football games, music concerts, and other events. The land is owned by the city. It planned to enter into a long-term lease with Duckett, his company Black Diamond Consulting Group, and its soccer partner, Premier Sports Management Group. While the city was planning to pay less than $1 million to prepare the site for development, Duckett said he was ready to privately finance a $30 million to $40 million stadium. Council President Shawn Wooden has also come out against the deal. This is the second of two major stadium projects being pursued in the city. The first is a new minor league baseball stadium, which is under construction and on pace to open in April. The soccer stadium was the second. The stadium being built for the minor league Hartford Yard Goats now has a sponsor and a name, and the Yard Goats will play baseball at Dunkin' Donuts Park. Hartford's new minor league baseball team will be the Yard Goats. Team and city officials announced the name Wednesday, complete with two goats, after a contest to rebrand the former New Britain Rock Cats.